Conway City Hall is located at 1201 Oak Street, Conway, AR 72032; phone: 501-450-6100. Photo: Michael M. Hiegel House, ca. 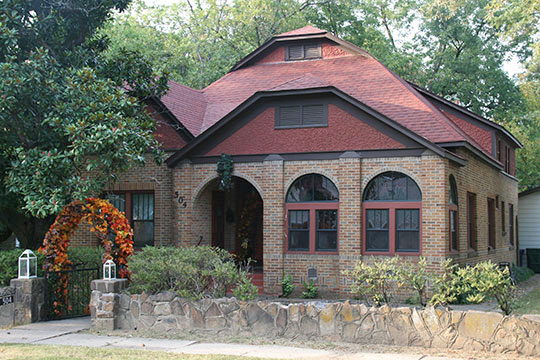 1911, 502 Second Street, Conway, AR. Listed on the National Register of Historic Places in 1998. Photographed by User:Cid.williams (own work), 2014, [cc-by-3.0 (creativecommons.org/licenses/by/3.0)], via Wikimedia Commons, accessed August, 2015. Conway was created and platted in 1871 when Colonel Asa Peter Robinson, an official with the Little Rock and Fort Smith Railroad, was offered a section of land as a reward for his services to the company as the chief engineer. Robinson chose a section of land, split by the railroad tracks, about thirty miles northwest of Little Rock. Allocating the section to the south of the railroad tracks as his private hunting ground and the northeast quarter as his town site, Robinson named it Conway Station. Centered around the railroad depot, the town grew and eventually the name was shortened to Conway. Hendrix College, the first of Conway's three institutions of higher education, relocated to Conway from Altus in 1890. Central College was established in 1892, followed by Arkansas State Normal School in 1907. Arkansas State Normal School was later named Arkansas State Teachers College, then State College of Arkansas, and in 1975, after reaching university status, was renamed again to the current University of Central Arkansas. While all three colleges were constructed outside the original boundaries of Conway, the colleges themselves are responsible for the development to the edges of the town. The Arkansas State Normal School was created in 1907 by the Arkansas State Legislature to train students to become teachers. In 1908, the lands to the east of the Normal School campus were re-platted by Ida B. Frauenthal, et al., and filed and recorded June 6, 1908. This re-platted area, the Boulevard Addition to the City of Conway, was laid out in a grid fashion and included the campus of Central College. Most of the blocks in this addition were divided into smaller lots and all blocks and lots were assigned a number. With the Arkansas State Normal School to the west of Boulevard Addition, and Central College within the Addition, the area began to develop as faculty members of both schools and others bought property and built houses. Ida Waldran House, Conway, Faulkner County, Arkansas Historic Preservation Program, Department of Arkansas Heritage, www.arkansaspreservation.com, accessed September, 2012.